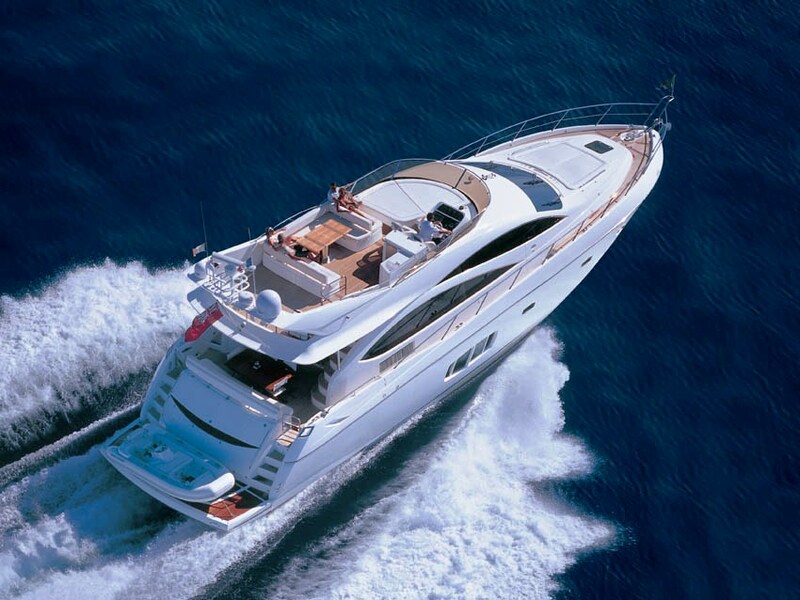 Luxury Sunseeker motor yacht JEEL is 22.28m (73' 1") in length and was built in 2008. This modern and popular Sunseeker Manhattan 70 was designed and finished to the highest specification making her the ideal charter vessel. Motor yacht JEEL has an elegant saloon featuring perfect all round vision and views due to her large windows, and incorporates a complete entertainment centre. There is also a beautiful dining area with seating for up to 8 guests. She has reverse cycle air conditioning throughout for maximum comfort and an excellent AV system. M/Y JEEL offers accommodation for up to 8 guests. Her full width Master cabin is located aft and features a large double bed with vanity area, an 80cm flat screen TV, CD/DVD player, radio, Safe and ensuite facilities. The VIP cabin located forward is also full width of the beam and has a double bed, 80cm flat screen TV, CD/DVD player, ensuite facilities. A Twin cabin has 2 single beds which can be pushed together converting to a double bed if necessary, a 50cm Flat screen TV, CD/DVD player, ensuite facilities. The final cabin is a twin cabin with bunk beds, there is a small individual DVD player available for top bunk only. This cabin has ensuite facilities that double as day head. The large fly bridge has liberal sunbathing areas and an alfresco dining area under a bimini cover – the perfect place to relax and enjoy the tasty delights fresh from the onboard BBQ. 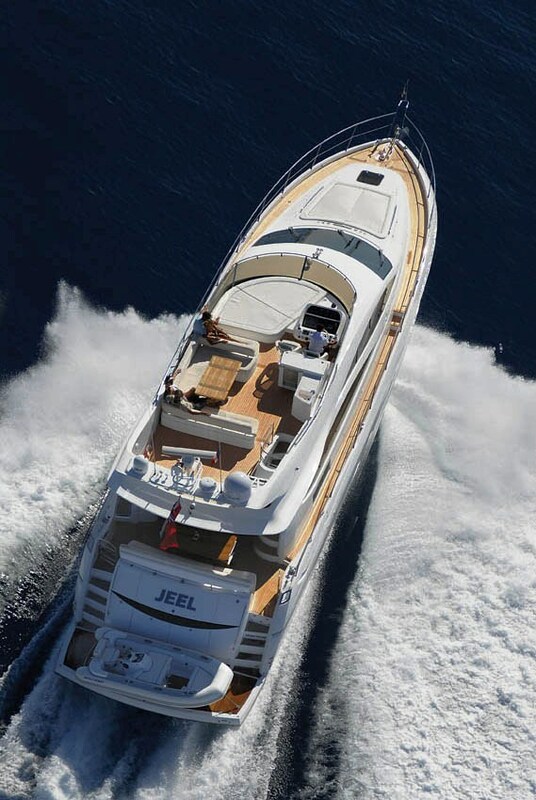 Motor yacht JEEL is powered by Twin MAN V12 1360hp engines and cab attain speeds of 22-29 knots. 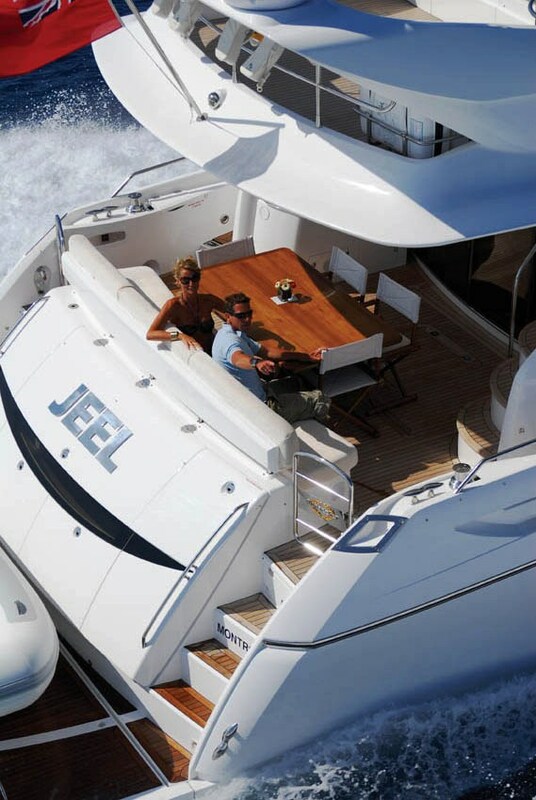 Motor yacht JEEL offers a combination of spacious accommodation, thrilling performance and ground-breaking design plus a good selection of water sports toys. The yacht is based in the Western Med year round and has a permanent berth in Beaulieu, South of France. 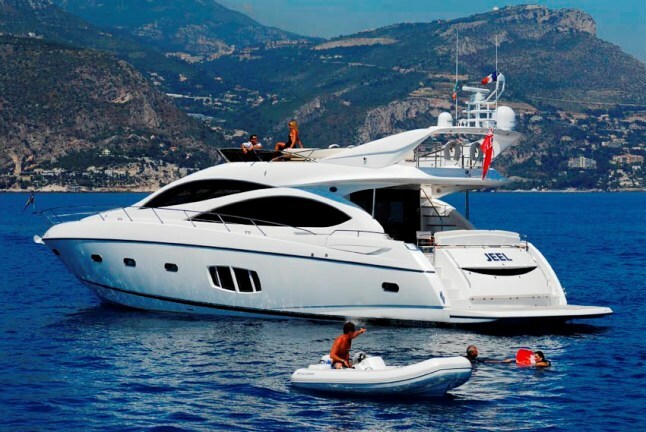 Sunseeker motor yacht JEEL has accommodation for a total of 8 guests onboard. Her cabin configuration is ideally suited to a maximum of 6 adults and 2 children. Her full width Master cabin is located aft and features a large double bed with vanity area, an 80cm flat screen TV, CD/DVD player, radio, Safe and ensuite facilities. The VIP cabin located forward is also full width of the beam and has a double bed, 80cm flat screen TV, CD/DVD player, ensuite facilities. A Twin cabin has 2 single beds which can be pushed together converting to a double bed if necessary, a 50cm Flat screen TV, CD/DVD player, ensuite facilities. The final cabin is a twin cabin with bunk beds, there is a small individual DVD player available for top bunk only. This cabin has ensuite facilities that double as day head. Charter motor yacht JEEL, the Manhattan 70 has the following selection of Tenders and Toys onboard: A Williams 385 tender, 103 Hp in board water jet, Wake board, Donut and Snorkelling equipment. Communications onboard include WI-FI access with fax/printer/scanner (available in French waters only). Audio Visual Equipment and Deck Facilities include a 40” LCD rise and fall TV in the saloon, Bose surround sound system, LCD TV's in master, VIP and twin cabin Satellite TV in saloon and all cabins - full UK SKY package, DVD/CD/Radio I-pod docking station in saloon only and a Separate Radio/CD system for exterior.